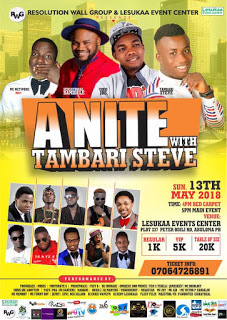 In 2016, we launched the race to project Port Harcourt Entertainment Industry through 'A NITE WITH TAMBARI STEVE' and in 2017, the second edition was mind blowing. Now in 2018, we are taking the race to a whole new level. Port Harcourt City, Get Ready!!! Lesukaa Event Centre, Plot 337 Peter Odili Road, Abuloma, Port Harcourt. ReGular 1,000; VIP 5,000; Table For Six 20,000. Buy ticket Online via www.NaijaTicketShop.com.